Imagine this… You went on an interview last week, didn’t hear back, and just sent a followup email. You check your inbox the next day and your stomach sinks- no new messages. Still nothing. The reality is the follow up email subject line you choose is important, and the email is too. You want an answer but you can’t send something too aggressive because it will ruin your chances of hearing back. So it takes a bit of experience to do it the right way. If you’re following up with somebody that has already emailed you, it’s usually best to keep the subject line the same. Example: Maybe you got an email telling you they’re working on scheduling your interview. Something like “We are still finalizing the schedule”. Just reply to that email and keep the same subject line they used, with a “RE:”. So your email subject line for following up would look like this: “RE: We are still finalizing the schedule”. Why is this an effective subject line for following up? They’ll recognize it right away so it will get opened fast. It has no chance of being mistaken for spam, etc. You don’t always have an existing email to reply to, so sometimes you’ll have to write your own email subject line. So let’s look at what you can send. 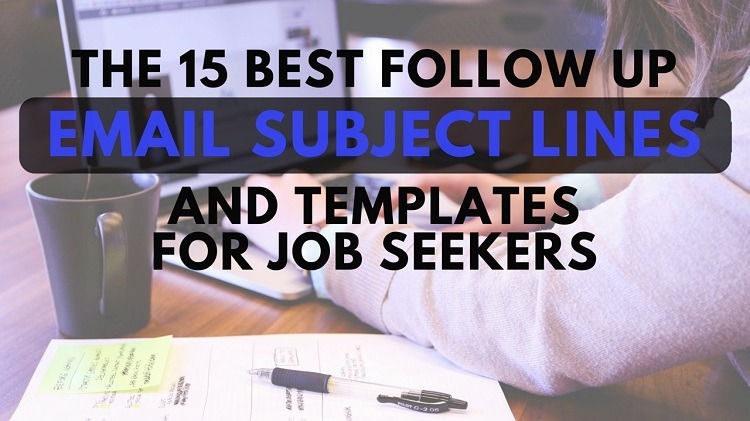 The more specific you can get in your follow up email subject lines, the better. So try adding details. You can mention the exact job title or something specific you discussed in the interview, like a question they asked you, or a topic they shared information about. You can include other details too, it depends on the situation and the person you’re following up with. Don’t make your subject line too long, but a bit of information is good and it’s okay if it’s around 8 words long. So you have your best follow up email subject lines picked out. What should you put in the email? For the last blank space, pick a skill or piece of experience that fits what the job requires. Something you learned from your past work, education, or training. If you do this, you’re going to set yourself apart from the other applicants. You’re reminding them of a specific reason why you applied and why you’d be a good fit. This is very important to do in your interview answers too, so make sure you’re always focusing on this in your interviews AND follow ups. A lot of job seekers just blast their resume all over the place, including for jobs they’re not a good fit for. So by stating why you thought it made sense to apply, you’re going to grab the company’s curiosity and they’re more likely to want to learn more about your background! It’s best to pick a specific topic you discussed with the person for your email, instead of just saying you enjoyed talking about the overall job. It’ll remind them of the conversation you had and show you were paying attention. And if you interviewed with multiple people in the company, they might compare emails. So send something slightly different to each person. In most interviews, you’ll talk about a lot of topics with each person you speak to. Don’t get overwhelmed when following up. Just pick one and mention it. Something that stood out or seemed interesting that they’d remember discussing with you. And choose something related to the other person’s area of focus. If you interviewed with the Training Manager, you want to stroke their ego by writing about something training-related. Let’s say you interviewed, sent a “Thank You” follow up email (or forgot to) and now you haven’t heard back in a few days or a week. What should you send? Remember to be direct and brief, stay polite, and be clear about what you’re asking for in your emails, so there’s no confusion. Your subject line matters a lot but that’s only half the battle, so put time into the body of your emails too. And if you have questions on this advice, you can leave a comment below.